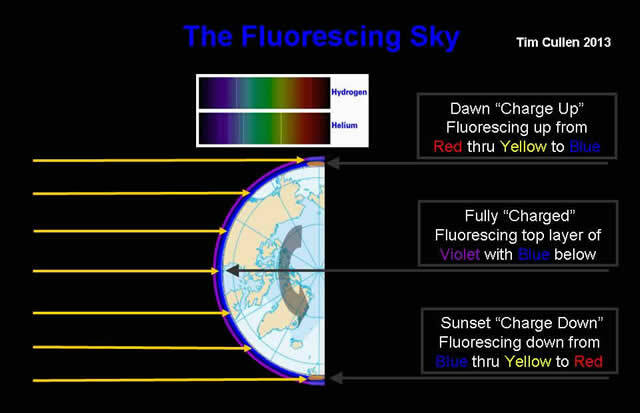 The fluorescing of the Earth’s upper atmosphere is an unavoidable physical process driven [primarily] by ultraviolet radiation from the sun. When a high energy photon [such as Cosmic Rays, X-Rays and Ultraviolet light] from the Sun is absorbed by [collides with] a gas particle [in the atmosphere] then the gas particle may become ionized [positively charged] by ejecting a negatively charged electron. Photoionization is the physical process in which an incident photon ejects one or more electrons from an atom, ion or molecule. Photoionization occurs in the Earths ionosphere which stretches from an altitude of 50 to over 1,000 kilometres. The ionosphere is a shell of electrons and electrically charged atoms and molecules that surrounds the Earth, stretching from a height of about 50 km (31 mi) to more than 1,000 km (620 mi). It owes its existence primarily to ultraviolet radiation from the Sun. Ultraviolet (UV), X-Ray and shorter wavelengths of solar radiation are ionizing, since photons at these frequencies contain sufficient energy to dislodge an electron from a neutral gas atom or molecule upon absorption. In this process the light electron obtains a high velocity so that the temperature of the created electronic gas is much higher (of the order of thousand K) than the one of ions and neutrals. The population of negatively charged electrons in ionosphere clearly demonstrates the level of ionisation that is occurring [via Photoionisation] in the atmosphere. 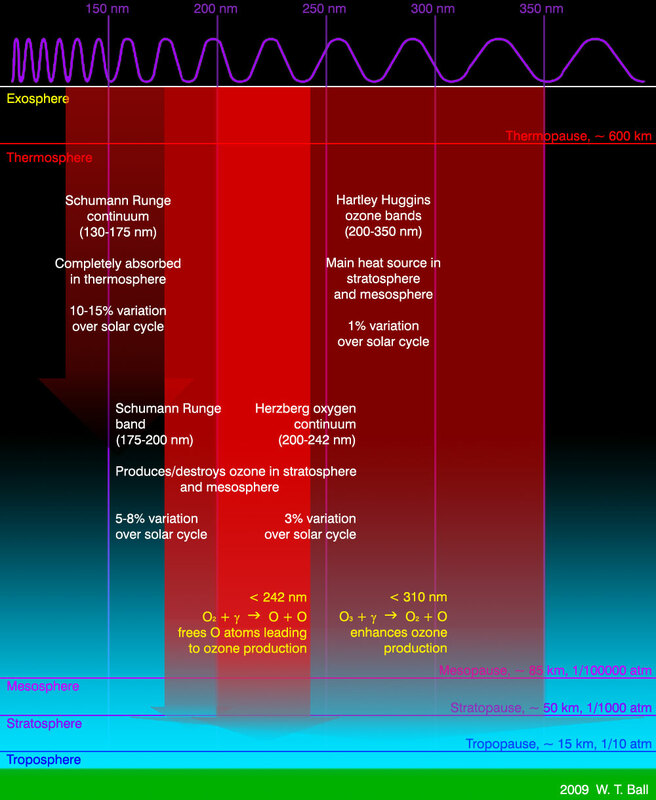 The following graphics provide an overview of how high energy ultraviolet solar radiation is absorbed in the upper atmosphere. 1) An electron has an inelastic collision with a neutral atmospheric particle. 2) An electron recombines with a positively charged [ionised] atmospheric particle. 3) A high energy photon collides with an atmospheric particle. 4) Chemical reactions between atmospheric particles [chemiluminescence]. Fluorescence is the emission of light by a substance that has absorbed light or other electromagnetic radiation. It is a form of luminescence. In most cases, the emitted light has a longer wavelength, and therefore lower energy, than the absorbed radiation. However, when the absorbed electromagnetic radiation is intense, it is possible for one electron to absorb two photons; this two-photon absorption can lead to emission of radiation having a shorter wavelength than the absorbed radiation. The emitted radiation may also be of the same wavelength as the absorbed radiation, termed “resonance fluorescence”. The mainstream [such as Wikipedia] refers to this atmospheric fluorescence as airglow. 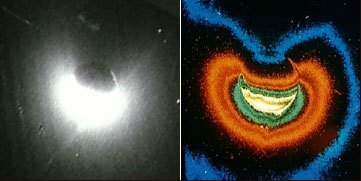 Airglow is caused by various processes in the upper atmosphere, such as the recombination of that which were photoionized by the sun during the day, luminescence caused by cosmic rays striking the upper atmosphere, and chemiluminescence caused mainly by oxygen and nitrogen reacting with hydroxyl ions at heights of a few hundred kilometers. However, the mainstream claim that airglow “is not noticeable during the daytime” is simply preposterous because the underlying physics means that fluorescence is inevitable and continuous. The Wikipedia entry actually contradicts the claim that airglow “is not noticeable during the daytime” because it clearly states that airglow is caused [amongst other things] by “the recombination of that which were photoionized by the sun during the day”. The recombination process [of ions and electrons] is a continual process that is at a maximum when ionisation is at a maximum [during the daytime]. Electrons don’t go on strike during the daytime. Electrons don’t refuse to recombine until the sun has set. Electrons aren’t embarrassed to recombine in broad daylight. Electrons don’t have ethics, scruples or legal obligations. The reverse process to ionization is recombination, in which a free electron is “captured” by a positive ion. Recombination occurs spontaneously, and causes the emission of a photon carrying away the energy produced upon recombination. As gas density increases at lower altitudes, the recombination process prevails, since the gas molecules and ions are closer together. The balance between these two processes determines the quantity of ionization present. Radiative recombination is the process by which an ion in state-i binds an electron from the electron sea to produce state-(i-1) with the subsequent radiation of photons. Both continuum and line photons can be produced in such a recombination event as the electron passes from the continuum (i.e. free) levels into the upper bound levels of the ion and then cascades down to form a ground state ion. The fluorescence of atmospheric Helium has been clearly observed in the ultraviolet spectrum. The fluorescence of atmospheric Hydrogen has been clearly observed in the ultraviolet spectrum. 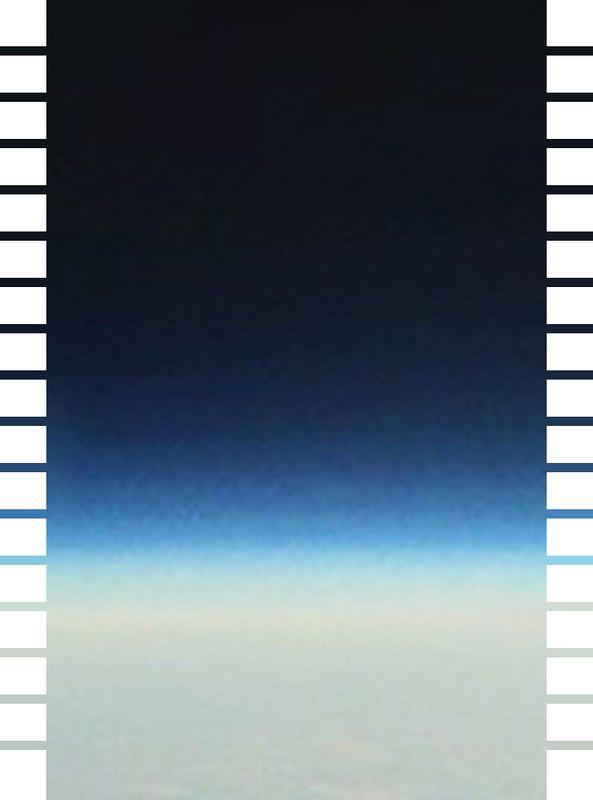 Operation StratoSphere has [independently] produced wonderful imagery of the upper atmosphere. 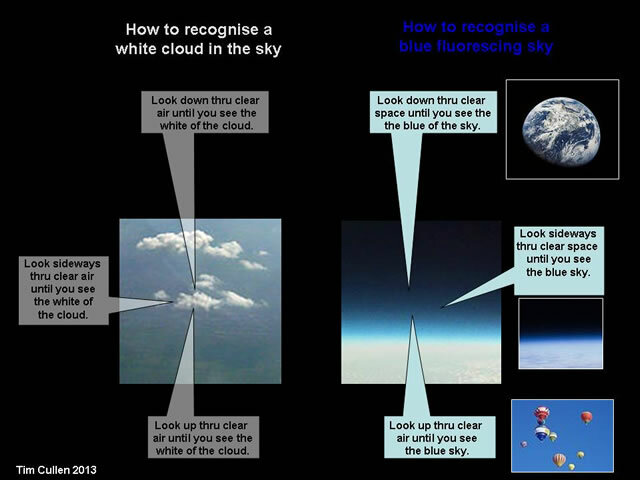 If we then zoom-in and enlarge the image of the atmosphere then the fluorescing colours become more discernable [especially with the aid of “pullout” colour blocks]. The colour spectrum becomes plainly evident if the background image is removed and the “pullout” colour blocks are enlarged [see below]. Descending down through the atmosphere the particle density slowly increases while [conversely] the strength of the incoming solar radiation slowly decreases [due to atmospheric absorption]. 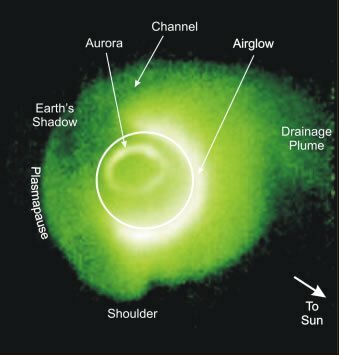 The uppermost layers [mainly hydrogen and helium] in the atmosphere are absorbing high energy solar radiation and fluorescing [predominantly] in the ultraviolet spectrum and appear as almost black bands in the visible spectrum. 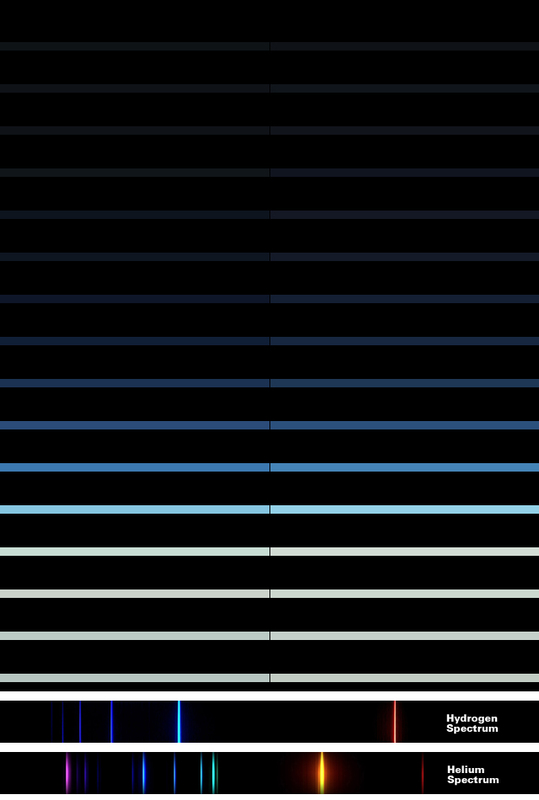 Slowly, the fluorescing steps down from the ultraviolet spectrum to the visible spectrum and the atmosphere start to emit in the violet [and then down to indigo] spectrum. Descending lower in the atmospheric the emissions start moving into the blue spectrum as the intensity of the solar radiation [in the ultraviolet spectrum] becomes weaker. The ionising potential of the solar radiation peaks at an altitude of between 250 and 200 kilometres and this implies that the [predominately] electric blue colour of the sky is emitted at this altitude. 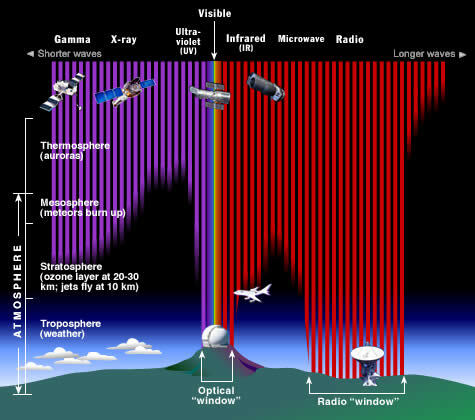 Descending below 200 kilometres the atmospheric ionisation [and emissions] decreases gradually down to 100 kilometres and then declines dramatically down to 50 kilometres [which is generally regarded to be the base of the ionosphere] where atmospheric fluorescing effectively stops. Below 50 kilometres the reduced strength of the solar ultraviolet radiation [coupled with the increasingly density of the atmosphere and its predominant molecular composition] causes atmospheric molecules to be split into their atomic components [photodissociation]. This process is especially noted for the dissociation of O2 into atomic oxygen which can then recombine to form O3 – Ozone. Gallery | This entry was posted in Astrophysics, Cosmic Rays, Earth, Solar System. Bookmark the permalink. I’m flattered that you’d use my imagery as an example to demonstrate your point. How’d you end up finding my project to use as a reference? You’ll have better luck extracting images from that rather than from the panorama viewer. You can see the triangles used to render the image in the screenshot you have from the viewer. This one is not from one point in time, but instead stitched from what one camera saw over the course of about 3 minutes. Thank you for your truly amazing images! 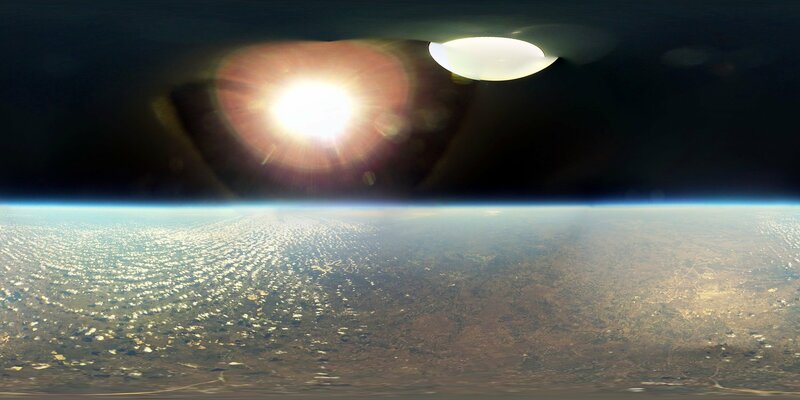 The above is the result of two years’ work by Texas local Caleb Anderson, who got in touch to share the results of Operation Stratosphere. The late [and great] Ralph Rene realised that the Earth’s atmosphere fluoresces and subsequently performed a remarkably simple experiment that proved [to his satisfaction] that the sky fluoresces.